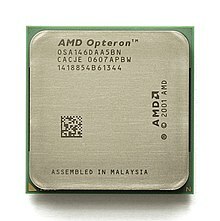 x86-64 (an aa kent as x64, x86_64 an AMD64) is the 64-bit version o the x86 instruction set. It supports vastly lairger amoonts (theoretically, 264 bytes or 16 exbibytes) o virtual memory an pheesical memory nor is possible on its 32-bit predecessors, allaein programmes tae store lairger amoonts o data in memory. x86-64 an aa provides 64-bit general-purpose registers an numerous ither enhancements. It is fully backward compatible wi the 16-bit an 32-bit x86 code. ↑ AMD Corporation (September 2012). "Volume 2: System Programming" (PDF). AMD64 Architecture Programmer's Manual. AMD Corporation. Retrieved 2014-02-17. This page wis last eeditit on 25 Dizember 2015, at 20:31.